The Lincoln Navigator is unapologetically huge. But large, luxury SUVs don't have the sales numbers of the small crossover market. So it's no surprise that the automaker is tossing its luxury hat into that profitable ring with the new Corsair. If you are a hermit crab, your home is whatever you find for your shell. 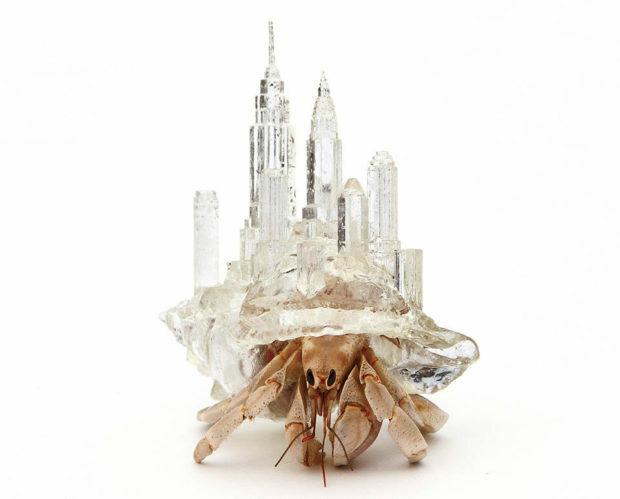 Artist Aki Inomata makes 3D printed shells for hermit crabs to set up their homesteads inside of. These shells have little buildings and cityscapes on top. So these crabs are living in these various cities. Or under them. Aki starts with a CAT scan of an actual hermit crab shell to make sure it’s an acceptable shape for a little crab to fit in, then she 3D models and prints the shell with a building or cityscape on the back. Do these crabs even know how cool their new shells are? Do they know that they are carrying cities on their back? Do they feel the weight on their shoulders and in their soul? Actually, they don’t have shoulders. My bad. These shells are very nicely detailed. Congrats to Aki for giving nature’s creatures some cool new bling. These creatures don’t even need to shell out any money. Get it? I guess they have the world under their feet and a city on their back. Wait… Technically they are wearing the world beneath them. We all are. Whoa. Mind blown. I’m shell-shocked.